Two lipolytic enzymes, hepatic triglyceride lipase (H-TGL) and lipoprotein lipase (LpL), are responsible for the catabolism of lipoproteins in the circulation (1). H-TGL is bound to endothelial cells lining the sinusoidal cavities of the liver and has been identified on the adrenals and ovaries as well. These steroidogenic tissues utilize cholesterol derived from receptor-mediated and receptor-independent pathways (2–7). Recent studies suggest that only the hepatocyte is capable of synthesizing H-TGL, and that extrahepatic H-TGL is derived directly from hepatic secretion (8). The level of hepatic secretion of H-TGL has been shown to be partially responsive to specific hormonal concentrations in the plasma and several factors in situ. However, no evidence has yet linked H-TGL expression to regulation of the cholesterol biosynthetic pathway. In this study we demonstrate that the expression of H-TGL in the transformed hepatic cell-line, HepG2, is induced under conditions in which the cholesterol biosynthetic pathway is inhibited. 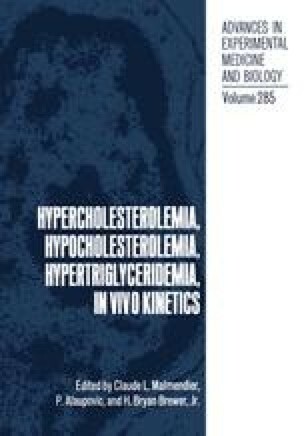 We demonstrate that by depriving the cell of a biosynthetic intermediate prior to cholesterol, H-TGL expression is substantially induced.